For John Gibson, it has been quite the journey traveled getting back to the position of being the Anaheim Ducks starting goaltender. After being thrust into the position following an injury to teammate Frederik Andersen last spring, Gibson went 3-0 with a 1.33 GAA to end the season but ran into difficulties in the playoffs which was to be expected for the 20-year old. 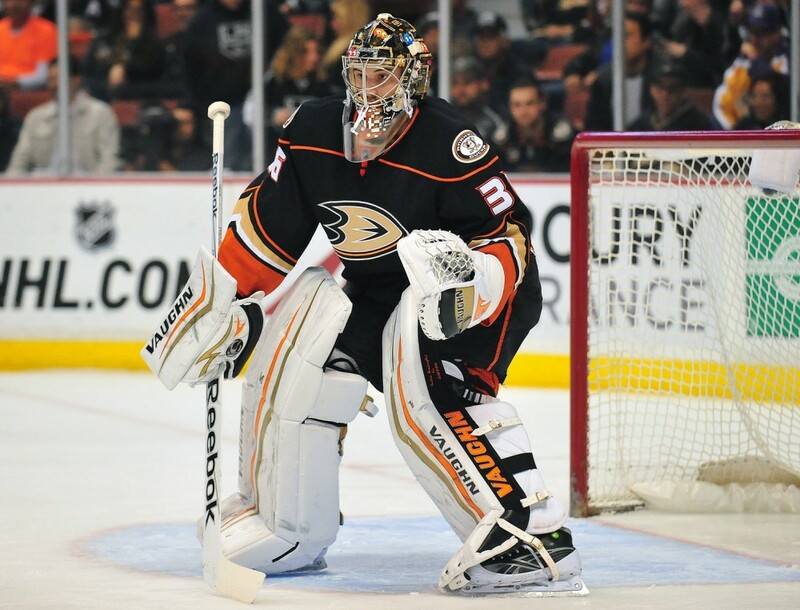 In what ended up being a move surprising to some, the Anaheim Ducks made the decision in the offseason to part ways with veteran goalie Jonas Hiller in favor of Gibson and Frederik Andersen. In June, general manager Bob Murray eluded to the fact that a youth movement was underway in net and as the 2014-2014 season, both young goaltenders were given the opportunity to compete for the starting position in net. Although John Gibson was given the chance to compete with Andersen for the starting job; his time up with the Anaheim Ducks was brief as he was injured in warmups prior to the start of a November 1st tilt against the Colorado Avalanche. Gibson suffered a groin injury leaving him sidelined for six weeks and upon his return to action was sent down to AHL Norfolk as the Ducks made the decision to bring in veteran goalie Ilya Bryzgalov with the hopes of stabilizing their situation in net. While down in the minors, Gibson posted impressive numbers and eventually a second opportunity to make an impact in Anaheim was created when Frederik Andersen suffered a head injury during a game on February 8th. Gibson was called up by the Ducks to backup for newly anointed starter Ilya Bryzgalov. The Bryzgalov experiment ended up being a disaster as he was 1-4-1 with an eye popping 4.19 GAA in only eight appearances and put to an abrupt end when while struggling on February 10th against the Florida Panthers, the call was made for Gibson to relieve Bryzgalov and the young goaltender has since seized the opportunity to remain in net for the Ducks; just look at this example from a save made Sunday night against the Dallas Stars. After struggling in his first two starts, Gibson has since stabilized and won five out of his last six starts and even the return of Frederik Andersen being announced for Tuesday’s game in Arizona, there are some that believe the goalie competition many expected to see at the beginning of the season could be reignited. One thing for sure is that in the midst of what was a frenzied trade deadline which saw six transactions made by the Ducks; the biggest acquisition(s) made could both be between the pipes as John Gibson and Frederik Andersen could end up battling it out which might mean even more bad news for teams chasing the Ducks in the standings.